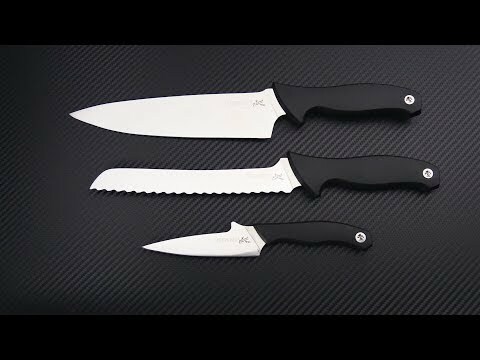 Ernest Emerson designed, Kershaw built set of 3 kitchen knives with blade protectors ready to step up the cool factor of your food prep station. The 3 Piece Cook's Set includes a Bread, Chef's and Paring knife for all around utility. Each blade is crafted from satin finished DIN 1.4116 stainless steel and sharpened to a razor's 16 degree cutting edge. Full tang construction with lightweight glass-filled nylon handles for balance and easy maintenance. Each handle has comfortable Emerson stylings for lengthy cutting. Perfect for kitchen or campsite.